Not a very catchy title but the serum itself is wonderful, as is the whole Garden of Wisdom brand, but more on them another time. 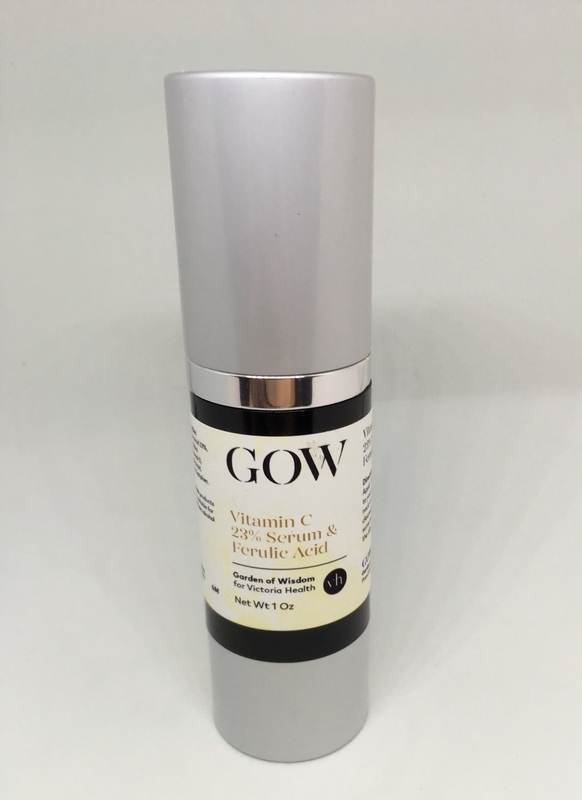 This Vitamin C is the strongest you will find, is combined with ferulic acid which will improve it's stability and is the real deal for those wanting help with skin tone, antioxidant benefits and pigmentation. You can read all about Vitamin C here and Ferulic Acid here - I'd don't want to repeat myself too much but there are very few product featuring either of these ingredients that has really impressed me and this has. Vitamin C, in this case in the form of L'Ascorbic acid, has been proven to help protect the skin from free radicals and help improve collagen production. However, it can become unstable and ineffective if exposed to UV and oxygen. You don't need to worry about that with this packaging which includes a dark bottle and a pump dispenser. The pump dispenser on mine is a little temperamental - you can see from the discolouration on the label and the lid that it sometimes splats about a bit when it's pumped into your hand. This is probably due to the consistency and slight gritty nature of L'Ascorbic and is easily avoided if you cup your hand around the pump as you dispense it. The first time I used it I felt quite a tingle which at least confirmed for me this is a high concentration of L'Ascorbic acid - a tingle is normal and I haven't felt it since that first time, your skin can take a little while to get used to some actives. I've been using this at night on clean, dry skin but you can use it in the morning if that works better for you. Although Vitamin C helps prevent inhibit the production and oxidation of melanin, you need to wear a sunscreen with this if you are using it in the morning as it can make skin more sensitive to the sun when it's first applied. When Vitamin C is mixed with ferulic acid the ferulic helps protect the Vitamin C from oxidation whilst also protecting skin for the damaging (and ageing) UVA rays. They are an antioxidant dream team. It is thought that 20% is about the maximum that can be absorbed by the skin but Victoria Health have a lot of knowledge in this field so I trust them, what I can say is this is the strongest L'Ascorbic Acid you are going to get and the price is incredible. I bang on about wearing a high SPF all the time but when we were in France this year I was too ill to reapply properly and had some definite patches of pigmentation when I returned. I was so pleased to have this to use as soon as I got back. I get asked a lot about how to help pigmentation - this is it.